Jesse started his professional career singing in a few clubs in Michigan, with the Doug Cook Combo, and on his own, before joining The Fabulous Tones in Los Angeles as a featured singer. After a year of touring, he decided to strike out on his own, instantly becoming a hit in various Palm Springs supper clubs during the "Hollywood playground" days in the 70's. 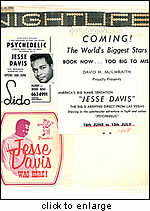 Movie stars Rita Hayworth, Kim Novak, Doug McClure, Darren McGavin, Denise Darcel, David Jannsen, Paul Burke; and singer Jackie DeShannon were a few of the many celebrities that were frequent patrons at Jesse's performances. Of special note, First Lady Betty Ford came to see him twice, the second time bringing her husband, President Gerald Ford. The first lady caused quite a stir later in the evening when she said she would not leave until she had a dance with Jesse! The Secret Service scrambled, and President Ford was very gracious about it, and difused the situation by dancing with one of the female Secret Service members! 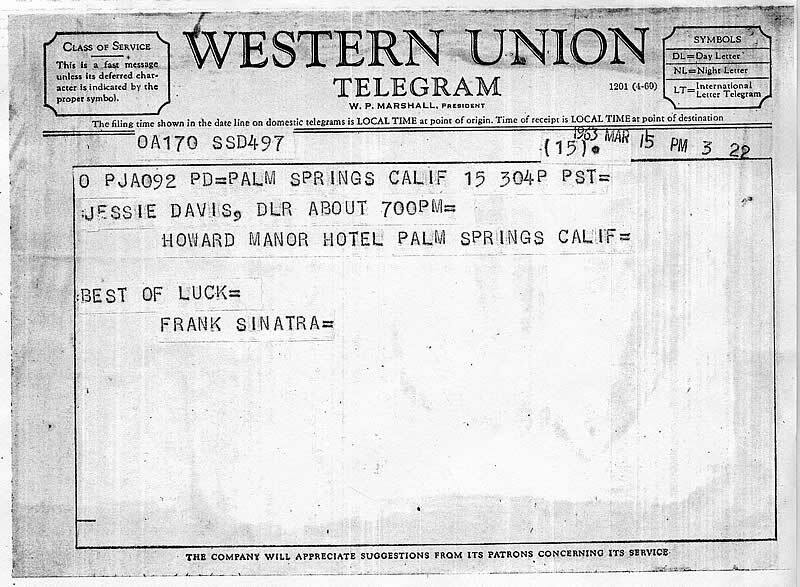 A couple years later a fan in Palm Springs that knew Jack Entratter, who ran the Sands Hotel in Las Vegas, called Jack to tell him about Jesse, and an audition was setup. 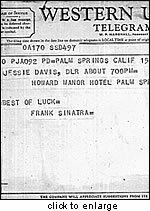 Jesse found out just moments before the audition that he would be auditioning not only before Mr. Entratter, but also Frank Sinatra, and Dean Martin's wife....and not in the Lounge, but in the big Copa Room where Sinatra performed. Upon arriving in the Copa Room, he found out that the sound technicians had forgotten to set up a microphone, so Jesse thought the audition was doomed. But he went ahead and sang, without a mic, in that huge room. After just three songs, Sinatra turned to Jack Entratter and said "What are you trying to do, blow the kid's voice out?....give him a job"!! 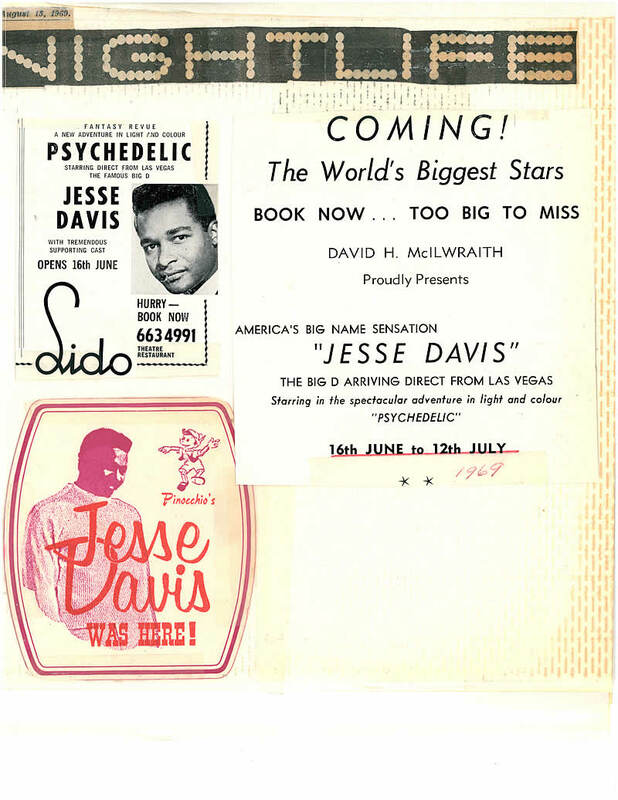 That began Jesse's many appearances at the Sands, which led to other engagements at the Sah ara, Dunes, Rviera, Stardust, and Maxim...and at Cal Neva, Harrah's and the MGM in Lake Tahoe and Reno. While performing in Hollywood, he received a call from a prominent club owned in Sydney, Australia with an offer to headline a large musical review. That engagement lead to bookings throughout Australia, and New Zealand, including many TV appearances, as well as the recording and release of this first album, Movin' Along. He also recorded many singles, some of which were only released overseas. During an engagement in Acapulco, vacationing movie producer Joe Camp (of "Benji" fame) caught Jesse's show and was so impressed that he asked Jesse to co-star in his upcoming television special "The Phenomenon of Benji", to be filmed throughout Europe. Later, he also signed Jesse to record the title song of Benji feature film "I Feel Love", for release as a single. 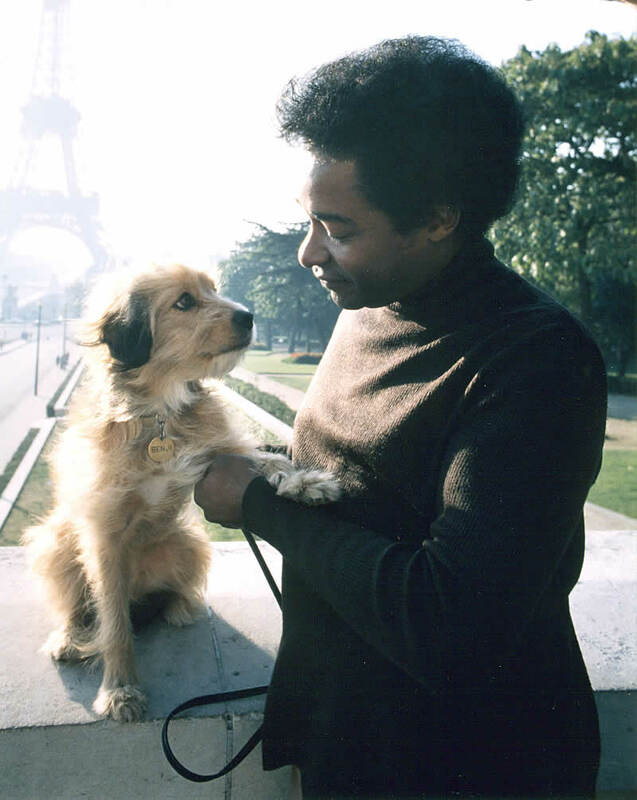 Jesse and Benji in Paris, during a break in filming. 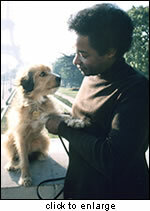 The song won the Golden Globe award for Best Song and was nominated in the same category for an Academy Award. Within the next few years, Jesse co-starred in a second Benji TV special, "Benji at Marineland", and had a singing role the western movie "Hawmps". A sampling of television appearances over the years include: Nightman, Sun Up San Diego, PM Magazine, Good Morning L.A., The Lita Baron Show (Palm Springs), Siempre En Domingo (Mexico City), Tonight Show (Sydney Australia) and Australia's version of Hollywood Squares. Although raised in Michigan, his first few years were in Louisiana with his birth certificate saying he was born in Franklinton. He later found out, on a trip through New Mexico, from a man he met, that he was actually born in "Camp Nine" too long of a story here, but Jesse did go on to write a song, "The Man From Camp Nine"! !